Two Dalit youths Killed in Allahabad for 4 rupees. A clash over payment of mere Rs 4 turned deadly when a group of brahmans fired at two dalits, killing them, and injuring three others in Mohddinpur village in Ghoorpur, 25 km from Allahabad on Friday. In the backlash that followed, angry dalit mobs set fire to the flour mill and a portion of the house of the people who had shot and killed the dalits. 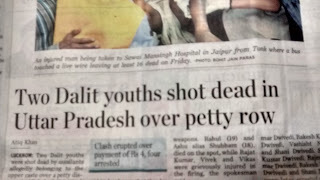 Those killed were identified as Rahul Bhartiya (19) and Shubham Bhartiya (18) of Mohddinpur and Dandi village. Trouble began when Rajat (22) reached the flour unit of Suresh and Rakesh Dubey and demanded 154kg of flour that he had given them for grinding on Thursday. When Suresh told them the cost of grinding was Rs 154, Rajat paid him Rs 150 and said the remaining Rs 4 would follow. At this, Suresh began arguing with Rajat and allegedly made some coarse remarks. Rajat left and returned to the shop with Rs 20, and allegedly threw it at Suresh's face, asking him to take his Rs 4 and return the rest. Feeling insulted, Suresh and his brothers attacked Rajat with a sharp edged weapon, leaving him bleeding. Suresh then ran to his cousins Rahul, Ashu, Gulab, Vikas and others, exhorting them for revenge. When the relatives and other villagers saw Rajat bleeding, they moved towards Dubey's mill and surrounded the house and the shop.